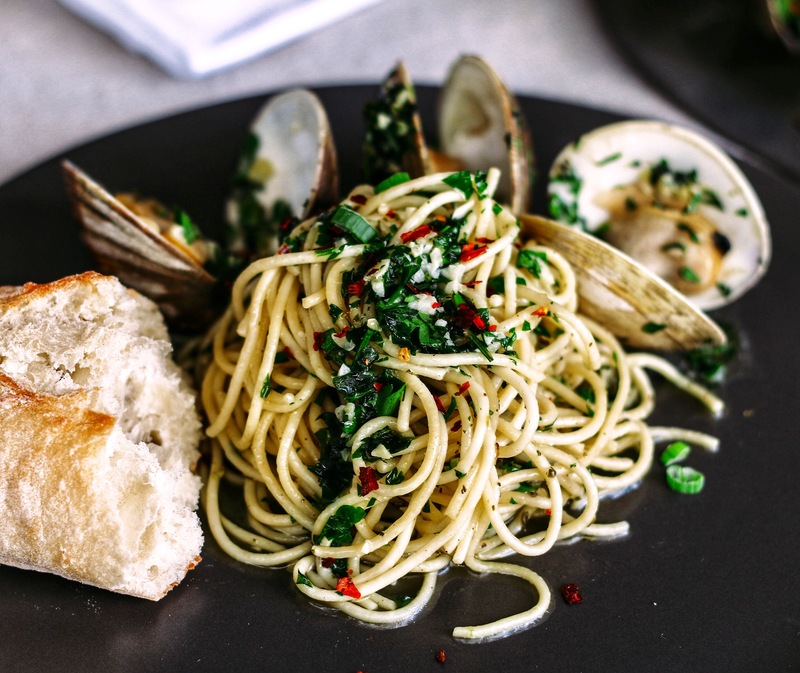 Rinse clams really well in cold water. Discard any already dead clams (if they are open and don’t close up themselves when tapped on the counter, they are already dead and should be discarded). Soak in cool water for 5 minutes, drain and repeat until water is completely clean and no signs of grit. Combine greens, parsley, vinegar, 1 garlic clove, salt and pepper in the bowl of a food processor; pulse briefly to chop. Slowly add ½ cup olive oil and pulse to combine; herbs should be finely and evenly chopped but not completely uniform. Transfer sauce to a bowl and set aside. Heat remaining olive oil and butter in large skillet with lid, over medium-high heat. Add shallot and cook 3-4 minutes, until soft. Add remaining garlic cloves, salt and red pepper flakes; sauté for 30 seconds or until fragrant. Add wine or sherry and stir for about 30 seconds until the sputtering dies down slightly. Add clams, then cover and let steam for 3 to 5 minutes or until clams have popped open. Any clams that remain closed at this point are dead and should be discarded. Remove from heat and toss with 1/4 cup of salsa verde sauce until evenly coated. Cook pasta according to package directions until al dente. Drain pasta; reserving ½ cup pasta water, return to pot. Add the chimiverde sauce and toss until well coated. Add some of the reserved pasta water if needed to thin sauce. Season to taste with salt and pepper. 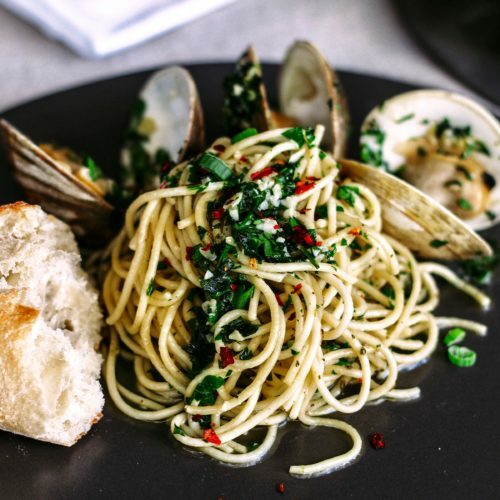 Divide among serving plates, top with clams, drizzle a little olive oil and sprinkle with chopped green onions (if using). Eat with crusty bread and additional sauce (if desired).